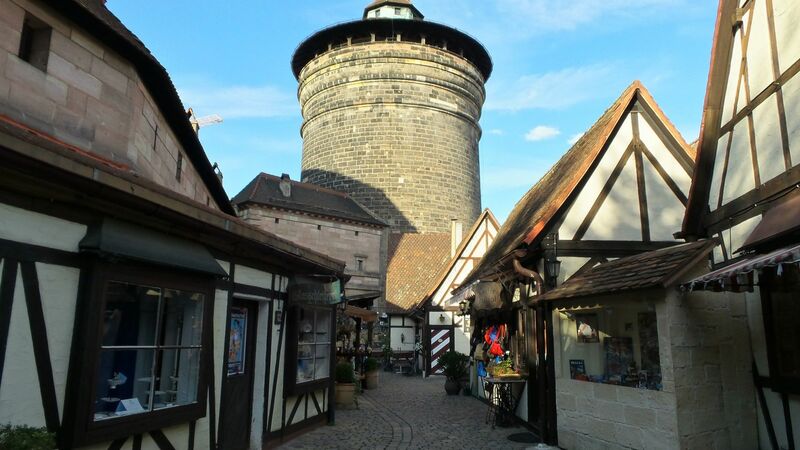 Have you ever dreamed of having an unforgettable and yet inexpensive Nuremberg tour? Have you ever wondered if there are any free things to do in Nuremberg? Well, in this post I will try to make that dream possible by sharing my experience in the charming German town. If by now you don’t know about my Nuremberg experience, give myNuremberg travel guidea read. 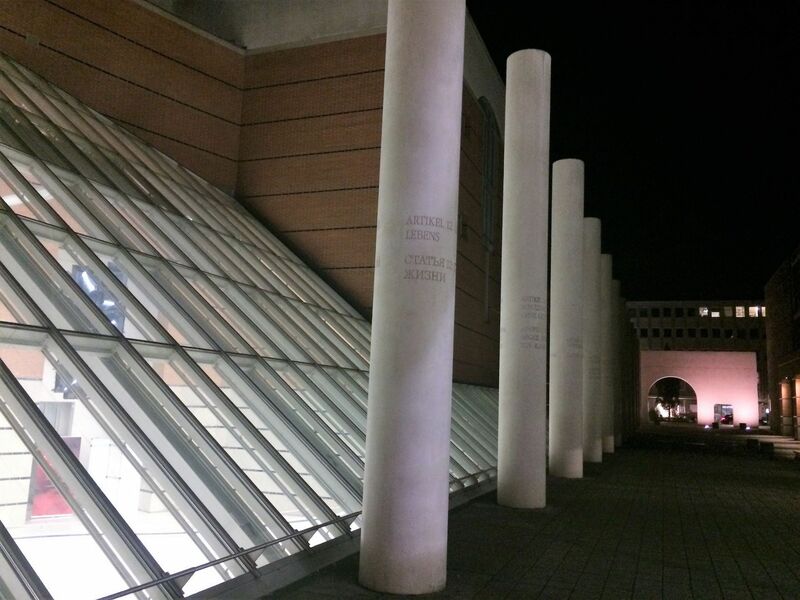 However, in this post, I would like to provide a useful guide on things to see for free for those that have found themselves in Nuremberg but cannot afford to spend too much (or at all) money during their stay there. 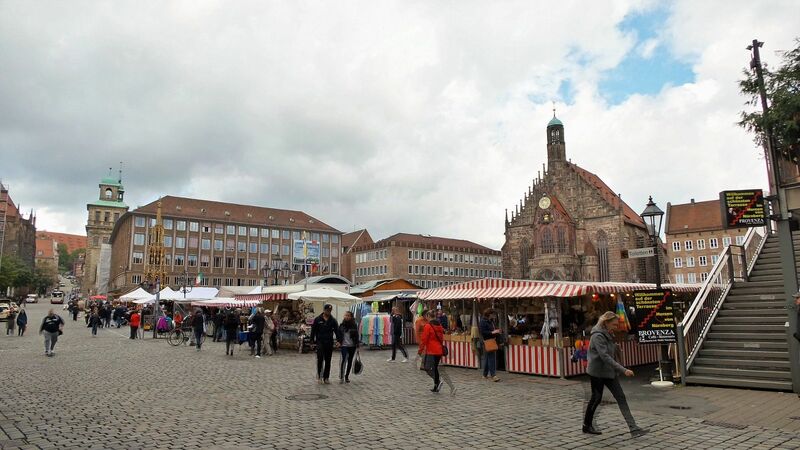 Before we start with the Nuremberg sightseeing, consider a free walking tour of the German city for a nice and relaxed insight to the city’s sights, history, stories and lifestyle. 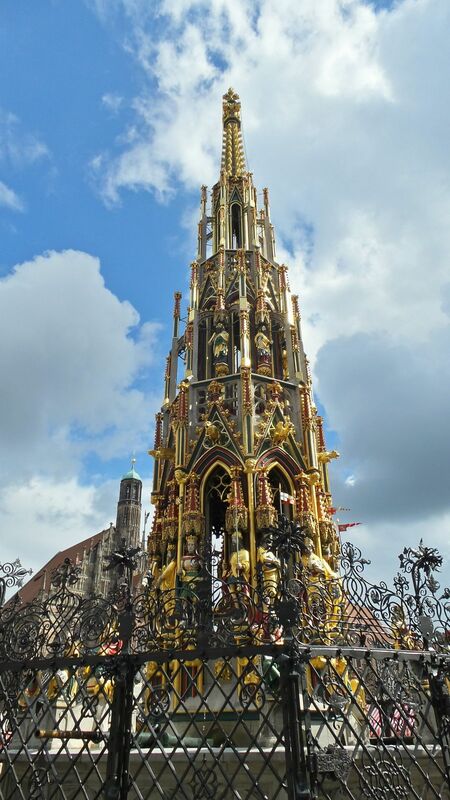 Consider joining the guided Free Walking Tourin Nuremberg offered by a group of young, local tour-guides. They organize English, German and Spanish tours regularly for quite a while already, and they are super passionate about what they do! You don’t need to sign up. Just come to the meeting point at one of the days they got tours scheduled on their website. You learn a lot in around 2.5 hours, get to meet other travelers and have a lot of fun. They basically bring you to most of the places, that I mention below, too and fill them with stories, facts and local-insider-tips, you wouldn’t get to know about when visiting these places individually. Also, there’s a little-lunch-break included in the tour, where they show you the best budget place for having the typical Nuremberg-snack: “Drei im Weckla” (three little sausages in a bread-bun/roll – delicious!). At the end of the tour, it’s appreciated to give the guide a little tip, depending on how much you liked the tour. In my opinion they definitely deserved it! It’s a great budget-friendly way to get to know the city, especially since their tour covers all the important sights of the old-town (Altstadt). The Altstadt is the old part of Nuremberg and it is packed with historical landmarks that are worth seeing. Gorgeous architecture, rich historical values, and picturesque streets can be enjoyed in the Altstadt completely for free. You can just wander around, relax on a bench, and if you feel like it maybe treat yourself to a cup of coffee or a German wurst. In any case, the Altstadt is mandatory for any free Nuremberg walking tour. The popular Kaiserburg Nurnberg or the Nuremberg Castle is a must-visit spot, even if you don’t want to spend any money there. Namely, visitors can walk around the castle and even inside the castle without paying any entrance fees. Entering the Tower or the museum buildings, however, comes with a cost that we decided not to pay. The view from the castle toward Nuremberg alone is worth the visit. The guided Free Walking Tour brings you to the castle, too. Here the guide tells you about the influence, the medieval history had on World War II history and explains what you can see from the viewing point. Hangman’s Bridge is a narrow, wooden and surprisingly charming bridge that has a nasty history. This was actually the home of the town’s hangman! Right at its beginning, you will notice a small museum where you cannot enter for free. Walking across the bridge, on the other hand, and taking photos is completely free; hence, that’s what we did! For the best budget-options for a typical meal in Nuremberg the guides on the guided Free Walking Tour can give you useful tips. 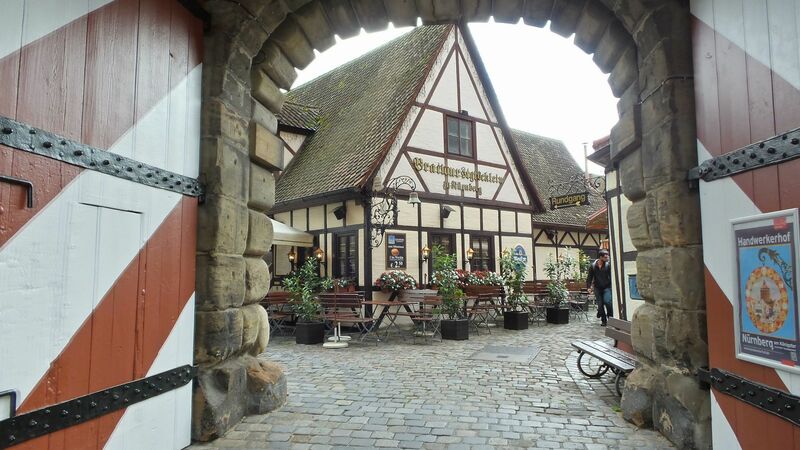 This popular Bavarian restaurant is featured in almost all reviews and souvenirs of Nuremberg thanks to its striking architecture and nice location. Going inside and tasting all the delicious specialties on the menu is certainly on our list for our next Nuremberg visit; however, since we couldn’t afford that this time, we just walked around, took photos and enjoyed the view. I’m telling you, it was great! 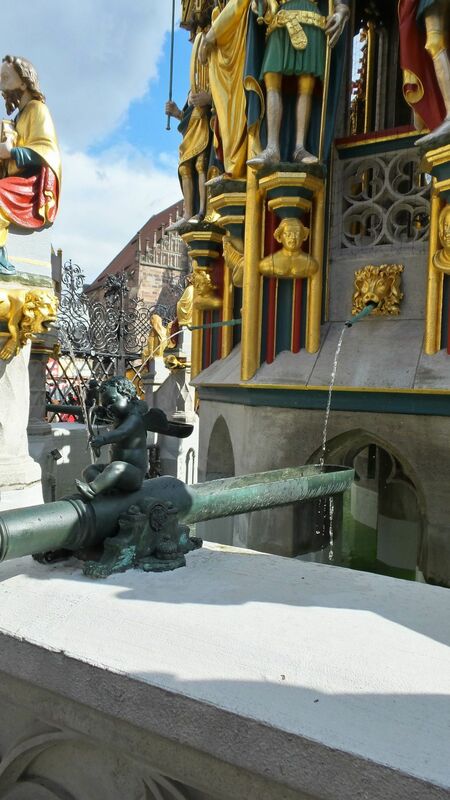 This 14-century fountain is found in the main marketplace of the Altstadt in Nuremberg. It may be easily missed during the Christmas season or the Altstadt Festival because of the tents, but it’s worth the sight. I would, therefore, recommend putting it on your bucket list and visit it. I mean, aside from its historical value and awesome design, it’s a magical fountain. Yup, I’m serious. 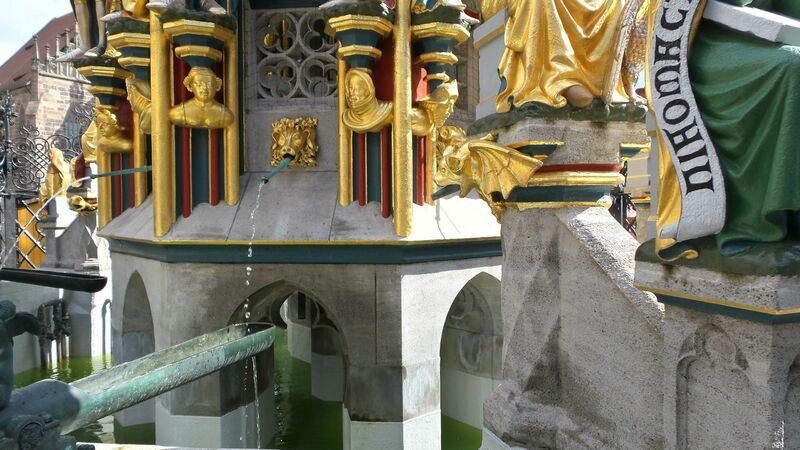 The locals’ story is that the gold ring on the fountain makes wishes come true once it’s turned three times. This monument is actually also the meeting point of the guided Free Walking Tour. On the tour you’ll hear about the famous legend of the wishing-ring. Not everyone’s cup of tea, but this medieval cemetery is one of the things that left me the strongest impression during my Nuremberg adventure. My travel partner and I made a deal not to visit the cemetery even though it was featured on many must-see lists because we thought it was creepy and possibly disrespectful. 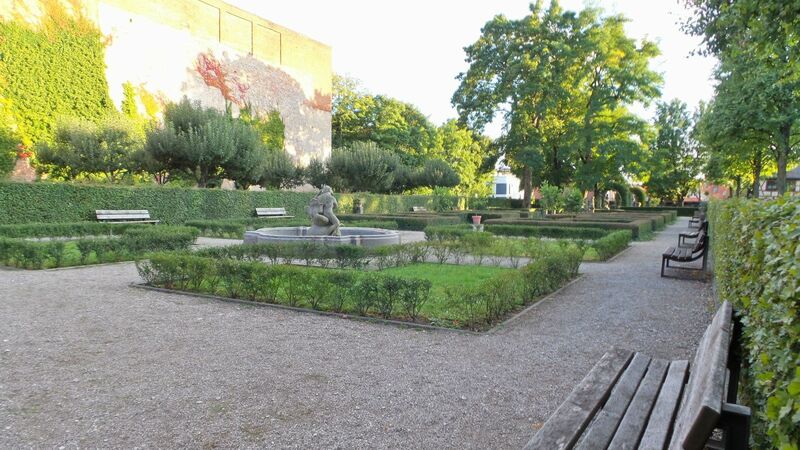 However, we accidentally found ourselves in front of its gates and decided to enter the eternal resting place of many prominent Nuremberg citizens; impressive statues, gravestones and rose bushes will take your breath away and chill your bones. It surely will give a new aspect of any Nuremberg tour. Another thing to experience in Nuremberg for free is the monumental outdoor sculpture Way of Human Rights (external site). It was designed and built as part of the town’s efforts to leave behind its Nazi-reputation and present itself as a place of human rights and peace. It’s right in front of the Germanisches Nationalmuseum, which, you guessed it, we didn’t visit due to its entrance fee. 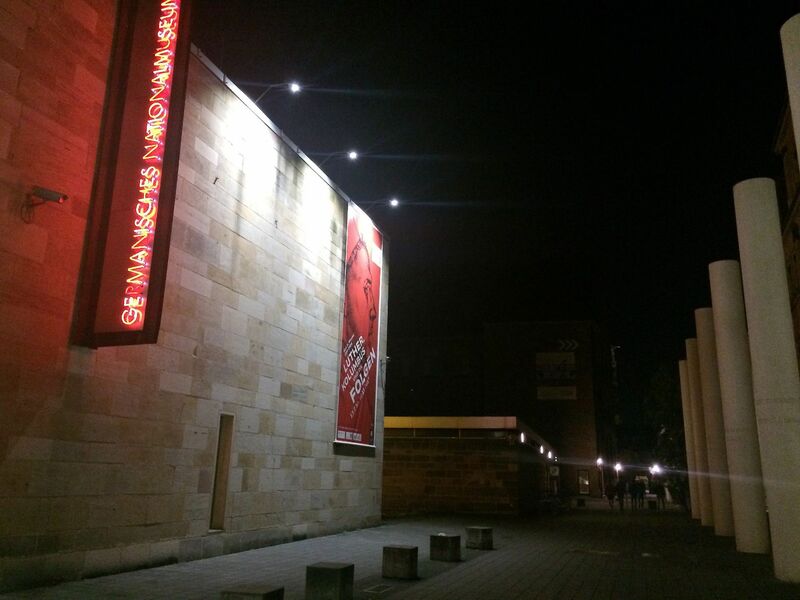 However, our guide on the guided Free Walking Tour told us, that every Wednesday the museum stays open after 6pm for three more hours – for free! So check it out then, when you plan to visit Nuremberg on a Wednesday and want to safe some money. 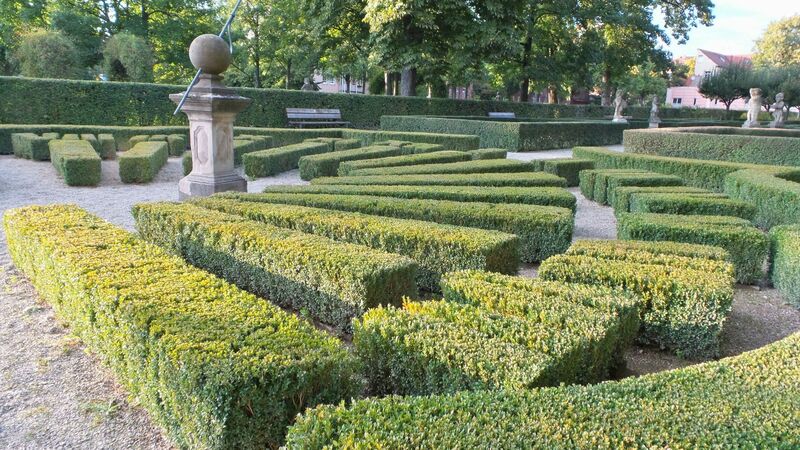 Whichever you chose you won’t regret it; we managed to visit both of these wonderful parks that will heal your soul and tired legs from endless walking with their well-maintained plants, bushes, and flowers. I personally always enjoy visiting parks because they give you a chance to see what the locals are doing there – working out, riding bikes, enjoying picnics etc. Naturally, you can use one of these spots for a picnic of your own while you’re having a budget-friendly lunch or planning what to do next; just hope for nice and warm Nuremberg weather and you’re sure t have a great time. The Handwerkerhof Nurenburg offers small shops dedicated to traditional German and Bavarian crafts. This beautiful section made of cobblestones and cute wooden houses is worth a visit for free and should be part of every Nuremberg walking tour. It’s located within the old city walls and Tower, right by the Bahnhof station. There are also few rustic restaurants alongside the souvenir shops. The Gardens of the Hesperides are outside the city walls and are the only gardens of the ring of gardens that existed around the city that were restored. We were a bit reluctant to walk that far and possibly find the place closed, since we headed there pretty late (around 5 pm and apparently from April to October the Gardens are open from 8 am to 8 pm); nonetheless, we were lucky to find its gates open and enjoyed tremendously our walk inside the gorgeous gardens. There are numerous statues and fountains that make for a perfect view as well as photos. So, if you ask me, any Nuremberg tour should include the magical Hesperidengärten. The guided Free Walking Tour also brings you to a charming square, called “Tiergärtnertorplatz.”It’s surrounded by beautiful old buildings that mostly weren’t destroyed during WW2. One of these buildings is the house, in which the famous painter Albrecht Dürer lived and worked for almost all of his live. In the evening everybody meets here for buying a beer at the “Wanderer”-pub, sitting together on the square and enjoy the sunset. It’s an amazing mood, that you have to experience when in Nuremberg. I hope that you found the Nuremberg sightseeing list useful, and that you will save lots of cash thanks to this guide. Most importantly, I hope that you will have a great time on your travel adventure and share your thoughts in the comment area. 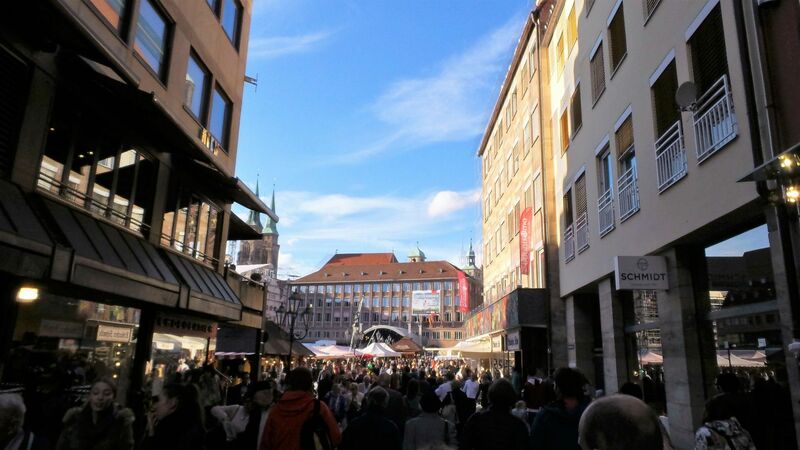 Lastly, go the worry-free way and join theguided Free Walking Tourof Nuremberg. Great place that I wouldn’t have thought of otherwise! Thanks for sharing this post! I’ve never been to Nuremberg so thanks a lot for these tips. Free things to do are always amazing! I visited Nuremberg this year, and I never expected it to like it so much. From the food to the people it was one of the highlights of my Germany Trip. There are some places in your article that I did not visit and that I’ll keep in my mind when I go back. I agree with your comment, the people and the good are great. I also didn’t get to see few places in Nuremberg due to the short time there. Hopefully, I get a chance to go again, soon. I’ve been to a few places in Germany, but never Nuremberg. This list looks so interesting, so maybe someday I’ll have to go back. Thanks for the tips! Go ahead and subscribe to our newsletter for more of our travel posts.